Art studies at Escola Massana, Escola d’Arts i Oficis Artístics, and at the ’Escola d’Arts del Llibre a Barcelona. Around the 70’s, (from 20th century) i have published worked on both general information publications and humor and satirics publications, including illustrations concerning political and social aspects. The newspaper Tele/exprés and the journals Serra d’Or, Oriflama, El Papus, Andalán, El Viejo Topo, Plaça Gran, El Drall, La Llufa etc. I have collaborated in the creation of several pedagogic devoted to literacy teaching of adult people, using a ecologist and sindicalist nature. Several posters for traditional celebrations and social movements. I’ve written some books, (when such things were still a tradition):CLERICARIUM (1983), MANIOBRES(1985 at Editorial Hacer), and PETIT COSTUMARI, (1991, at Editorial El Llamp. Even, a prize! : Best draw at Circulo de Lectores on 1996. Around middle 80’s, ( from 20th century ) I extended my formats, objectives and concepts; I focus my activity in exhibitions. Therefore, more time and calm towards creation. In Barcelona, at “Teatre Lliure”, at “ La Rosa de Foc” several times. At “Racó de l’Art”, at the “Casal d’Horta”, at the “Cotxeres Borrell” sponsored by ’Ajuntament de Barcelona. 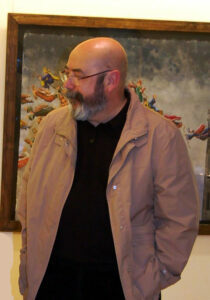 At the gallery “Cidi Hiaya”, in the city of Granada, some consecutive years. Collective exhibition at Leipzig during the year when the wall felt! At “Can Massallera”, in Sant Boi de Llobregat, also sponsored by the City Hall, at the Festa Modernista” (modernist party); in la Colònia Güell, and the last at the gallery “Lescribe-Brigitte Grifault” in Montauban, France. And here we are, still working on it “.